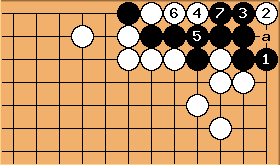 After , which makes an eye at the circled point, a and b are miai for life. After , Black has real eyes at the circled points. 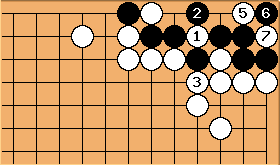 It seems as if creates a false eye, but the capture of three stones on the first line with results in a real eye. Even if White throws in at , Black lives with . If White captures a Black stone with , makes a second eye. Howver, if Black doesn't respond, White a kills the group. at the other 1-2 point is wrong. 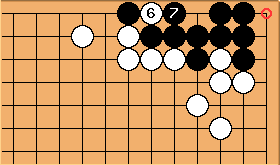 With , Black is dead. 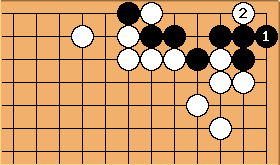 Even if Black is allowed two moves in a row, he can't live. 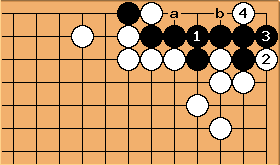 When Black plays here, White can choose between a and b to kill Black. Someone with an opinion which is the better ? We must look at the ko threats black has. 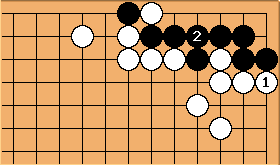 Here black can make two eyes by playing both 'a' and 'b', so either of them can be used as a ko threat. However, this is the only threat black can have from this position. Here black will again live by having both 'a' and 'b', so they are both ko threats. 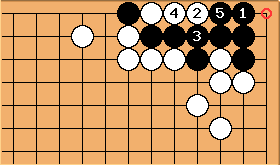 Again, no more threats for black. 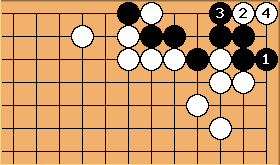 So, are the moves equal? Let's say the ko was crucial enough that white had to ignore this threat. 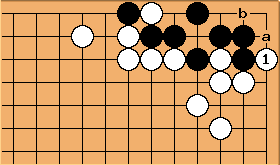 Can white have ko threats of her own to kill black again, if another big ko appears in the game? 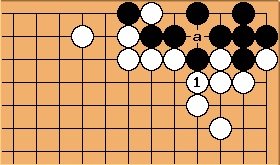 is the best she can do, threatening to make a ko for black's life at 'a'. 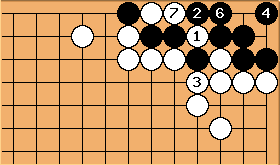 Connecting with Black , as shown here, is also wrong. and leave a and b as miai for the kill. Making the eye as large as possible, with here, seems live, but it is not the solution from the book. After , follows, and Black lives as shown. Alternatively, if would be followed by , White a, . ... when Black throws in at 3, White fails. 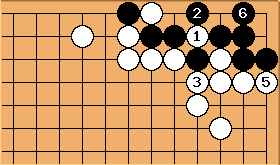 The authors of the variations shown here, have not yet found the reason why in the Main Line of *Solution* is preferred to of *Analysis by Members of Sensei's Library*. 4 at 1. The result is ko. Bill: Maybe this is the main line. Black lives with and , sacrificing a few stones. To avoid that, maybe White should start with . Now fills and is sente. This is better for White than the next diagram. 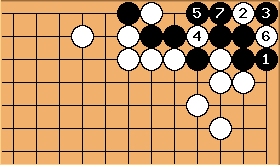 In the Main Line solution , White's descent at is not sente.